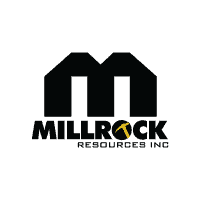 Dr. John-Mark Staude of President and CEO of Riverside Resources (TSX: RRI | OTC: RVSDF) sits down with Maurice Jackson of Proven and Probable to discuss the company’s successes in 2018 and the projected catalyst’s for 2019. 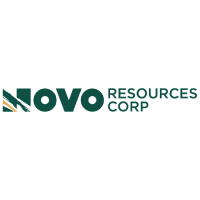 Dr. Staude will provide updates on a number of fronts, new exiting opportunities that look into significantly increase shareholder value. Maurice Jackson: Joining us for a conversation is Dr. John-Mark Staude, the president and CEO of Riverside Resources Inc. (RRI:TSX.V; RVSDF:OTCQB), where knowledge is golden. Dr. Staude, welcome to the show, sir. John-Mark Staude: Thank you, Maurice. 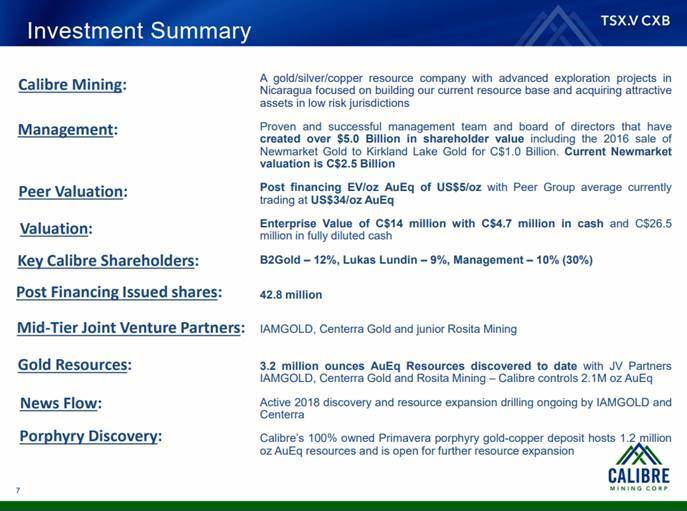 Maurice Jackson: We brought you on today to highlight some of Riverside Resources successes of last year and the company’s outlook for 2019. But before we begin, for first time listeners who is Riverside Resources? John-Mark Staude: Riverside is a prospect generator. 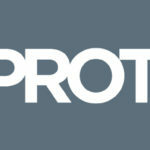 We’ve been working for 12 years, finding projects and finding partners through the prospect generator business. 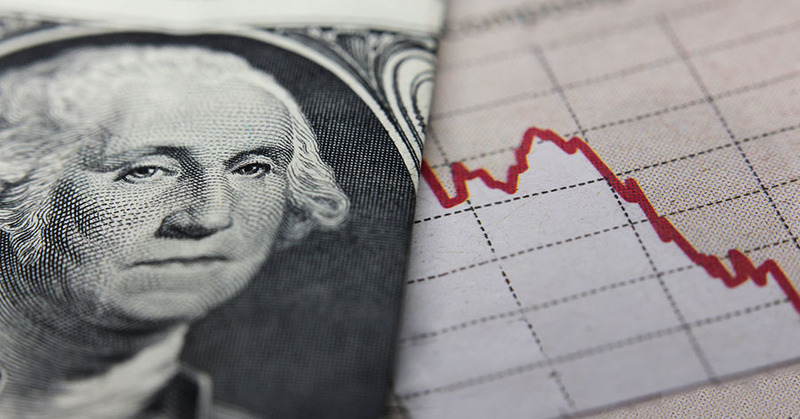 We’ve been able to expose ourselves to great upside while limiting the downside risk. Maurice Jackson: You referenced that you are a prospect generator. There’s a lot of ambiguity regarding prospect/project generators, therefore speculators often overlook them in their portfolio. 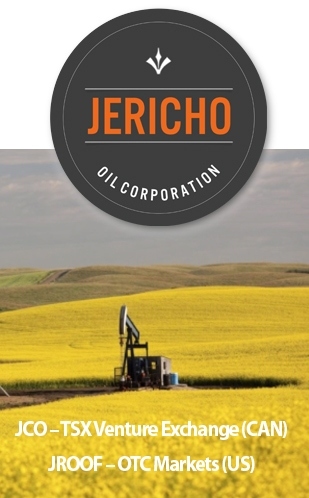 What type of competitive advantages does a shareholder have with a project generator over traditional exploration companies? John-Mark Staude: I think the first thing is you’ve got a tight share structure, key that other people are spending the money. The second is you get a lot of shots, multiple different projects going simultaneously. Third is you don’t have the management teams that have to continually go back and refinance, so they can be focused on discovery for the shareholders. Those three things make prospect generators one of the better ways to invest in mineral exploration. Maurice Jackson: Let’s revisit 2018 and share some of the successes of Riverside Resources that will serve as catalysts for 2019. John-Mark Staude: I think the first thing was that we were able to leverage off of our previous work on copper, so that in 2019 we’ll be able to generate new big strategic alliances. 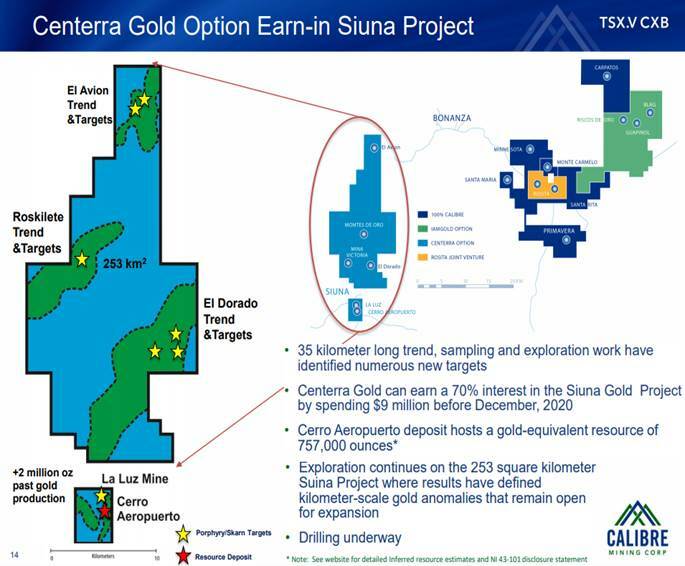 I think the second thing was we signed a letter of intent with Sinaloa Resources, and now in 2019 we’ll have the definitive agreement and the go forward drill program. I think a third thing was the work that we did on Cecilia. High-grade gold mineralization, very good geology. Now in 2019 we can see drilling. So we have lots of catalysts in 2019. We’re really excited about this coming year. Maurice Jackson: Speaking of 2019, let’s discuss the outlook for this year. What is new and what does Riverside Resources have planned this year? John-Mark Staude: I believe one of the key things is a new strategic alliance. Getting a strategic partner will be awesome, and I think we have that in our sights. I think the second thing will be drilling. We have now got a definitive agreement progressing with Sinaloa Resources, and we’ll have additional new assets added into the portfolio. We’ll also diversify beyond Mexico. We’ve done well in Mexico, but we’ve also been successful previously in porphyry coppers in Canada and large gold systems in Arizona, and I think in 2019 we’ll again see us diversify beyond Mexico to capture great new opportunities. Maurice Jackson: I want to expand further on the value preposition of Riverside Resources here. Germane to this discussion are the prices of gold, silver and copper. Twofold question. What are some of the catalysts you see that will change these prices, and what type of impact can we expect that this will have on Riverside Resources? John-Mark Staude: One of the catalysts we see now is some of the uncertainty around trade and some of the uncertainty particularly in the gold price and with this gold price we actually see that has been rising up; that for us is excellent. We have gold assets in the ground, and gold potential to grow. So I think the gold will be a really key way to do this. Maurice Jackson: Let’s be a little bit more specific for current and prospective shareholders. 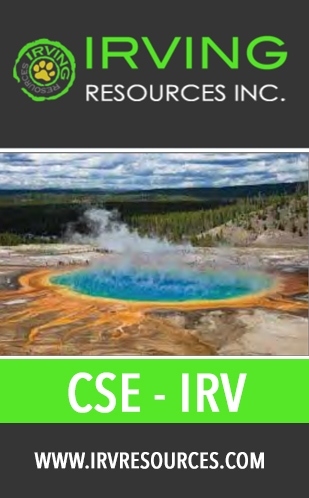 What type of competitive advantages does Riverside Resources have in the natural resource space included in this discussion with the prices moving? John-Mark Staude: One of the competitive advantages we have is knowledge. We have knowledge, we have been able to find gold. We’ve been able to find copper. We’ve been successful. 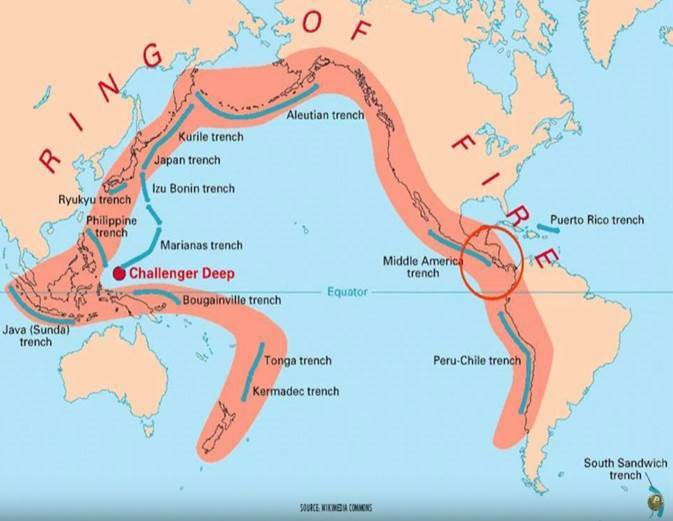 We’ve worked in this region and made discoveries that have then been built into mines. That’s a competitive advantage. The second is we’re all running. We’re in the position, we didn’t have to stop during the downturn times. We’ve been able to continually keep the same strong technical people. I know, Maurice, you’ve actually been out to site, other people come out to site. We can really demonstrate out on site the great development and ease to do the work. I think our turnkey ability has been shown by strategic alliances we’ve done in the past, and many projects we’ve been able to turn over. So in 2019, that creates great chance for catalyst rising gold prices, with potentially rising copper prices, with copper demand from electric cars, other copper usage. Riverside’s in an awesomely great position. 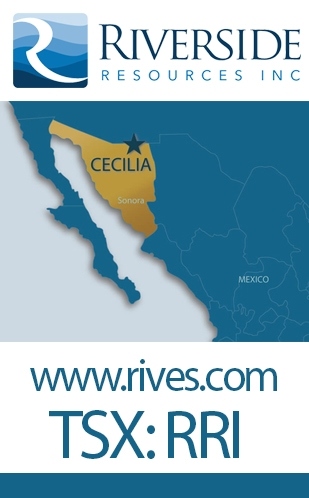 Maurice Jackson: Speaking of site visits, yes, I was there in April 2018 at the Cecilia, and I noticed there a lot of the intangibles that don’t show up on the balance sheet. Could you share some of those with us? John-Mark Staude: I think one of the ones is relationships. When you come out to the site you can see how well we get along with the local people. I think the second is ease of access, you can see that we have the gate keys, we have the ease to get to the projects, paved roads into the area’s infrastructure. It’s so easy to look at a map, but in reality when you go out and see that you can drive on paved roads, when you have power lines, when you have water, when you have all of that stuff. I think the other intangible is our team. When you can see that we have the people in the back of our company that do the work for many other supporting groups, can really do a good work. Riverside has a sought-after team. I think those are in some of the intangibles that really make Riverside unique. Maurice Jackson: Speaking of your team, a lot of them are seasoned in their tenure. Talk to us about how many years they’ve been with Riverside. John-Mark Staude: Riverside’s been going 12 years and some of them been going with us ever since the beginning. Many of them have worked with me before Riverside. 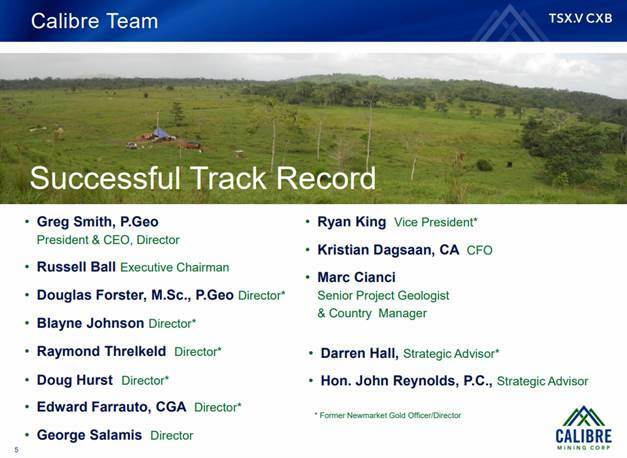 I used to work at Teck Resources, prior to that at BHP, and even prior to that back in the 1990s at Magma Copper, and some of these individuals that work with me today worked with me back then. We’ve been friends up to 30 years, and we’ve been able to be involved and we therefore we know we have trust, we know what we can count on, and we know we have the skills that deliver excellent projects, and the excellence to trust in what we’re doing. Maurice Jackson: Speaking of Mexico, there’s a new president. What type of impact do you foresee the new administration having on Riverside Resources? John-Mark Staude: It’s interesting, we were a bit concerned initially, back when the elections happened, hearing about socialist different movements and things, but really interesting, since December 1st when he’s been elected, it’s actually been pro capitalism, pro-development. There continue to be noises going back and forth about different issues, and they’ll have to get settled out. But we’re actually quite positive about the new president AMLO, and we’re also quite president about his words and efforts that he says towards helping develop favorability towards investments. So, we actually see that this new administration will be able to be a good push for the mining industry. We’re pretty pleased with what’s happening now. Maurice Jackson: Switching gears slightly, to make the Riverside Resources project portfolio come to fruition, joint venture partners have to be willing to commit to projects. 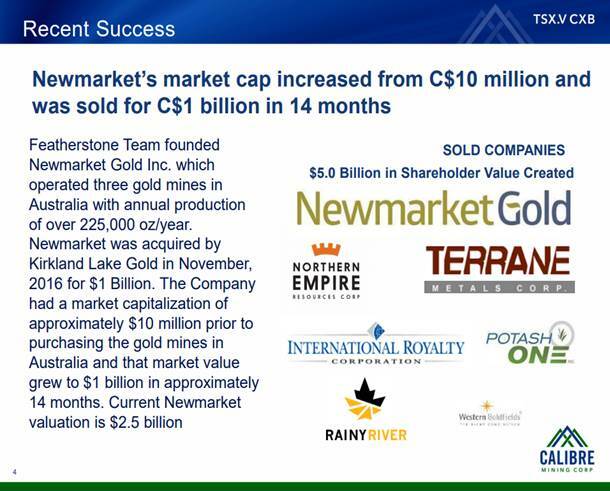 What is their current level of commitment that Riverside Resources is seeing right now? John-Mark Staude: Right now, the first thing is the really big strategic alliance we have coming. Second is a drill program and funding with Sinaloa Resources. We’ll come up with the news release coming out quickly here as we finalize the definitive agreement, which we’ve not yet finalized, but we’ll get that done, and that’ll actually be a major program. We’ll also find that we have work on the copper, gold and silver assets, and we’re working on spinning out our transaction for one of our other properties. So, we actually see quite a few number of flows of capital coming in, and quite a few catalysts in 2019 due to the partner spending. Maurice Jackson: You touched on it briefly, how does amalgamation fit into this narrative, and how realistic is the proposition of amalgamation? John-Mark Staude: So at this point what we’re talking about is actually taking one of our assets into another company. We’ve been working on it now. Two aspects, one is the capital and the other is the other party, the ability and interest to be able to carry it forward. We’re working on that now, and I think it’s fairly realistic to do. It’s not something that we’ve put all of our eggs into, but it would be a great step for Riverside to give our shareholders another set of shares, another strategic way of increasing shareholder value. I think we have the right team on the other side. This will be a really exciting transaction going forward. Maurice Jackson: John-Mark, what do you see as the biggest challenge for Riverside Resources, and how would you mitigate that situation? John-Mark Staude: One of the big challenges is getting more partners in Mexico, and the way we’re mitigating it is by doing work again outside of Mexico, and by doing that we have our skills and we have Freeman Smith, our Vice President, Exploration, lives in Vancouver, knows the Canadian portfolios and Canadian assets, and we live in Vancouver, Canada, so it really fits for us to be able to diversify. That diversification really helps our shareholders as well. It helps us being in Mexico, and leveraging off of our knowledge in other places as well, using our skills. We’re in a great position for 2019. Maurice Jackson: Let’s touch on the capital structure here briefly. John-Mark, Riverside has a proven record of being a good steward of capital. Remind us how many shares outstanding there are, enterprise value, and where does the company stand financially? John-Mark Staude: Riverside has almost 45 million shares out, after going for 12 years. That’s remarkable. Financially, we have $1.5 million cash, and the market is actually very low right now. So myself, I’m buying more shares. We’re at a low in the market conditions right now, and I think there’s great upside right now. Our enterprise value is only $5 million. Our market cap is $7 million. We’re in a good situation to have a good leverage to the upside now. John-Mark Staude: Well, you always ask great questions. I think one of the other things is what do we actually see in the next news release? I think the next news release for us will be the signing of a deal. Signing of deals is great. Those are the momentum steps that we like. Also, the addition of a new asset. We’re excited by that. So I think we have two new things coming on, short term, that will really make a difference for Riverside. Maurice Jackson: Dr. Staude, for someone listening that wants to get more information on Riverside Resources, please share the contact details. John-Mark Staude: We’re at www.rivres.com, or give us a call at (778) 327-6671. 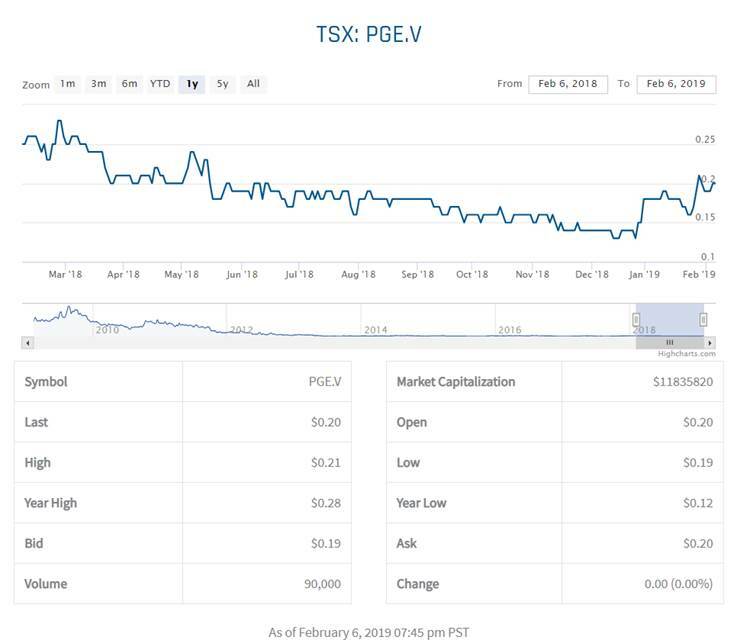 Maurice Jackson: As a reminder, Riverside Resources trades on the TSX, symbol RRI, and on the OTCQB, symbol RVSDF. As reminder, Riverside Resources is a sponsor of Proven and Probable, and we are proud shareholders of Riverside Resources for the virtues conveyed in today’s message. And last but not least, please visit our website, provenandprobable.com, where we deliver mining insights and bullion sales. You may reach us at contact@provenandprobable.com. 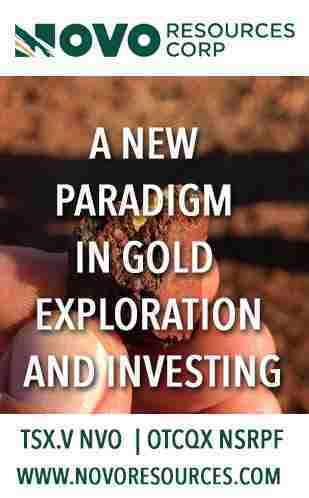 Want to read more about Gold? Sign up to receive the FREE Streetwise Reports’ newsletter. 5) From time to time, Streetwise Reports LLC and its directors, officers, employees or members of their families, as well as persons interviewed for articles and interviews on the site, may have a long or short position in securities mentioned. Directors, officers, employees or members of their immediate families are prohibited from making purchases and/or sales of those securities in the open market or otherwise from the time of the interview or the decision to write an article, until one week after the publication of the interview or article. As of the date of this article, officers and/or employees of Streetwise Reports LLC (including members of their household) own securities of Riverside Resources, a company mentioned in this article. This entry was posted in Base Metals, Energy, Exclusive Interviews, Junior Mining, Precious Metals, Project Generators on February 19, 2019 by admin. Is there an untapped market opportunity around premium mineral exploration ground in the USA covered by patented claims? I understand the fact that good land can be staked or optioned for cheap, but I wonder if some premium land is worth the premium? 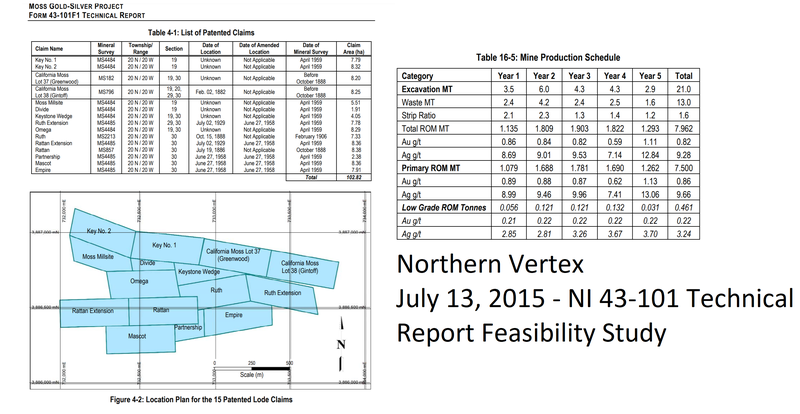 For example, Northern Vertex (TSXV:NEE) launched Phase 1 operations at the Moss Mine on a package of patented claims in Arizona approximately 100 hectares in size. 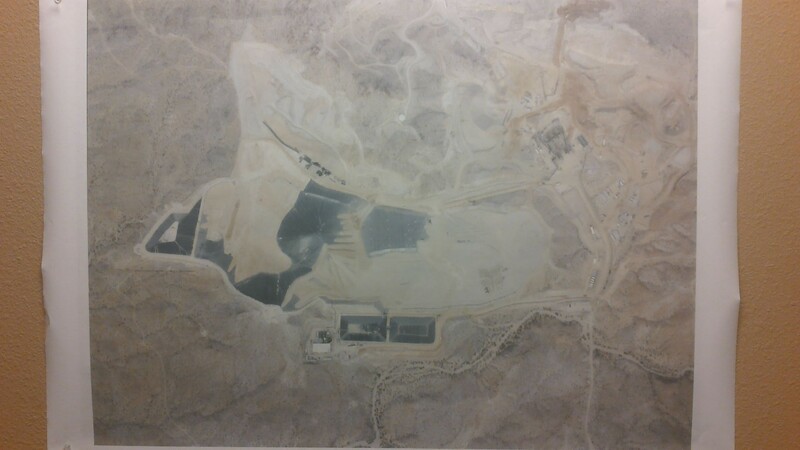 They are planning to produce for approximately 5 years at approximately +35Koz Au per year on that ground, with an open pit and heap leach all fit snugly onto that 100 hectare footprint. What is that package of patented group where NEE launched Phase 1 worth? 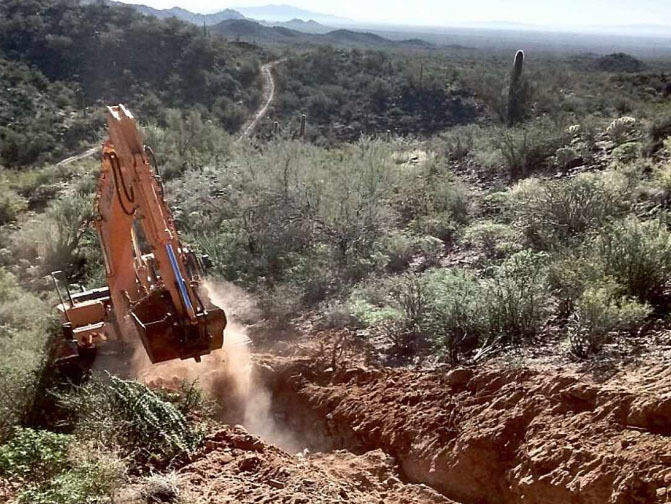 I suggest that patented claims in mining-friendly states like Arizona are a particular class of mineral exploration assets that deserve a premium. 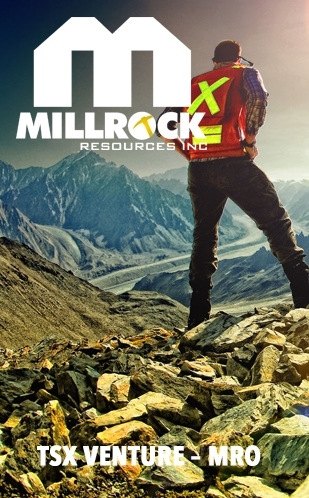 The devil’s in the details for exploration properties, but the Silver Nickel Mining Company have assembled such a portfolio and it’s worth a close look. The Silver Nickel Company is not a prospect generator for the Howe Street public markets, but they have assembled a portfolio of patented claims in Arizona, USA. This is a great place for mining, as with the example of the Moss Mine. I’ve introduced Silver Nickel to several public companies and the answer is consistently the same: the claims are too small and expensive. I understand the person who said, “The million $ price tag for exploration ground is probably something we would not take on.” but I wonder why? Surely there’s exploration ground in Arizona that’s worth millions of dollars? Maybe people are scared off by the large amount of data-verification that would be required to get these projects ready for prime-time? Maybe I haven’t found the right buyer yet. 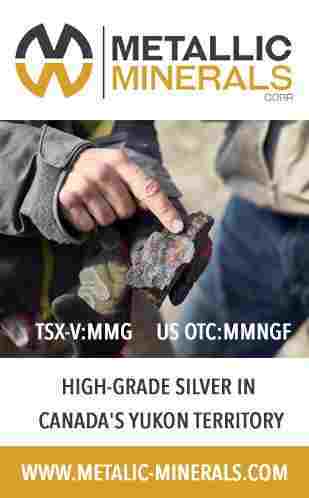 There must be investors out there who can imagine the potential of what Silver Nickel Company has and are willing to bring expertise necessary to determine if that potential is something worth exploring? It’s a long and winding road, but some people are keen to strike out on it. 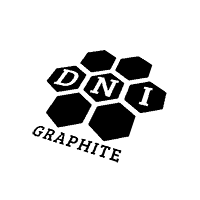 If you dig even deeper into the Silver Nickel story, then you will find that they have developed a sleuthing process to pick good patented claims off the garbage pile. They know how to navigate tax offices and the foreclosure process in a way that takes years of time and effort, but allows them to secure ownership of things like the Moss Mine for very little cost. The intellectual property in that and their geological understanding of Arizona alone could be very valuable to the right group who seeks to understand and help the John Rothermel and Neal Hawkins. Watch our interview above for more. John and Neal said in the interview that they’ve run the Silver Nickel Company as if it was their own money, because it was. I think they’ve built something special here and see great potential to use what they’ve done to seed public companies with great exploration projects. Easier said than done! Please contact me on CEO.CA if you would like to discuss all this further and watch for some field footage from an intrepid young geologist I met who may make the trek to run around a few of the prospects with John in Arizona this summer. This entry was posted in Exclusive Interviews on January 17, 2019 by admin. 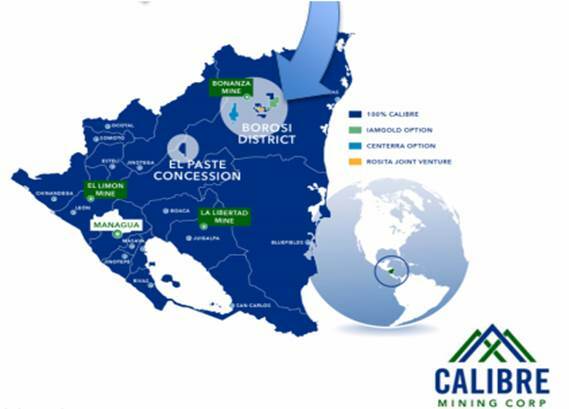 Ryan King, Vice President Corporate Development of Calibre Mining sits down with Maurice Jackson of Proven and Probable to discuss the value proposition on their flagship Borosi Project covering over a massive land position of 800 square kilometers in Nicaragua.Today’s interview is the most comprehensive interview to date on Calibre Mining. 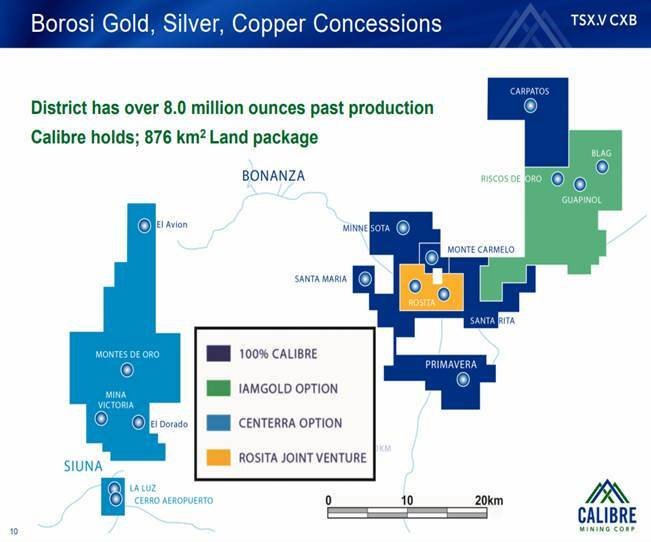 The Borosi Project hosts the Eastern Borosi, Siuana, La Luz, and Primavera projects, which Mr. King will discuss in great detail, along with the relationship and contractual obligations of Calibre Mining’s Joint Venture partners (Centerra Gold, IAMGold, Rosita Mining)on these projects respectively. 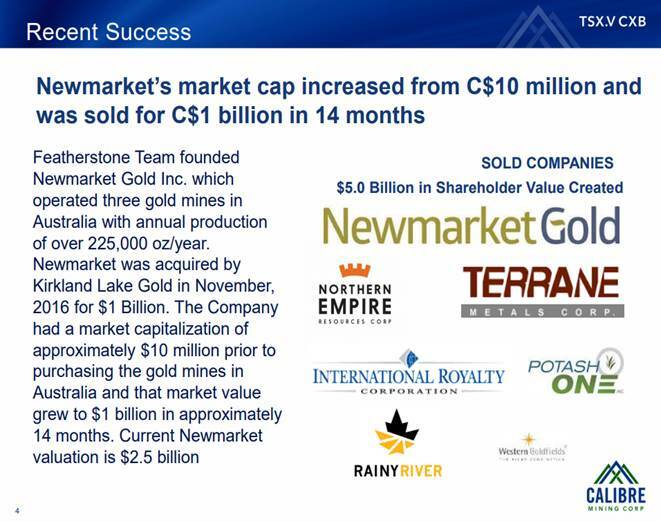 We discuss in detail each member of the Board of Directors, Management, and Technical team, which is comprised of a number of key members of the recent success of Newmarket Gold, which recently went from a $10 Million Market Cap to $1 Billion Market Cap and was sold to Kirkland Lake Gold . Finally, we will delve into the capital structure of Calibre Mining. 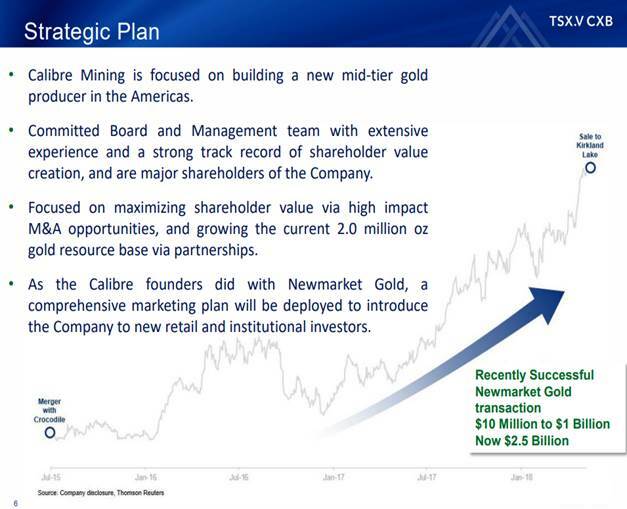 Important to note, Calibre Mining has $0 Debt, and a Management and Board with proven success of optionality and arbitrage. Lots of potential in and around La Luz. Again, our partner there is Centerra Gold. We’re getting close to a 51%–49% joint venture now, and it has an option to earn in to 70%. We’ve been drilling a number of targets, not only Cerro Aeropuerto but a number of targets along the whole 253 square kilometers that is auctioned to Centerra Gold. We’ll see where we decide to drill next year. There’s just so many different targets along this whole trend that look interesting to both Centerra and ourself. Ryan King: Absolutely. You can contact myself directly at 604-681-9944 or by cell phone 778-998-3700. That is the office phone number here in Vancouver, Canada. 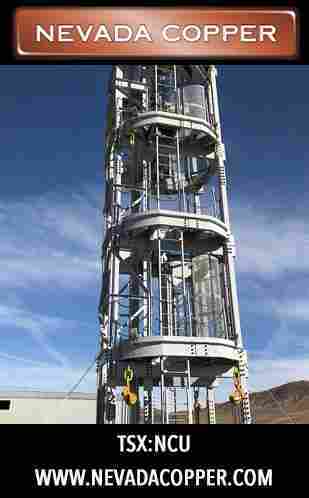 You can email me directly, rking@calibremining.com, as well as, of course, get information from the website, www.calibremining.com. This entry was posted in Base Metals, Blog, Exclusive Interviews, Junior Mining, Precious Metals on January 16, 2019 by admin. 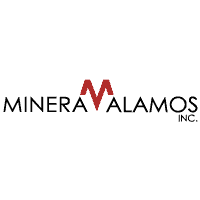 Michael Rowley, president and CEO of Group Ten Metals sits down with Maurice Jackson of Proven and Probable to discuss his companies exploration for platinum, palladium, nickel, copper and cobalt in the Stillwater area of Montana. Specifically, Mr. Rowley will address the latest press release regarding hybrid zone consisting of 14 target areas, 6 of which Higher-Grade ‘Reef Zones’ and 8 of which are large scale bulk tonnage “Platreef-Style’ Mineralization. 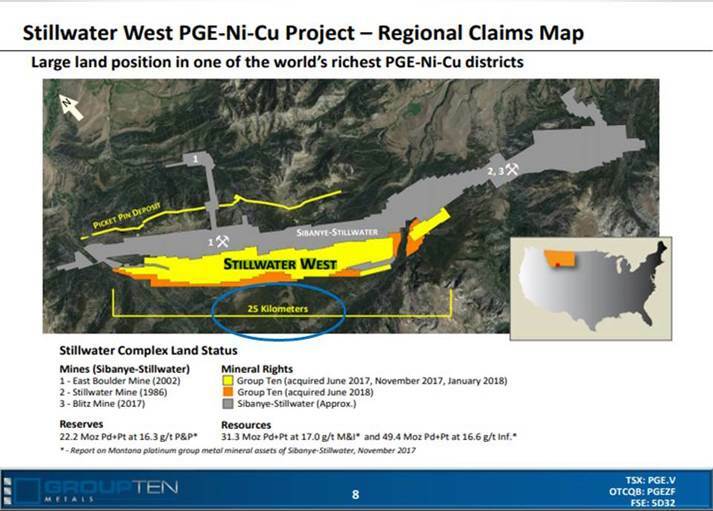 Michael Rowley, president and CEO of Group Ten Metals, speaks with Maurice Jackson of Proven and Probable about his company’s recent PGE discoveries in Montana and the similarities to projects in South Africa’s Platreef District. 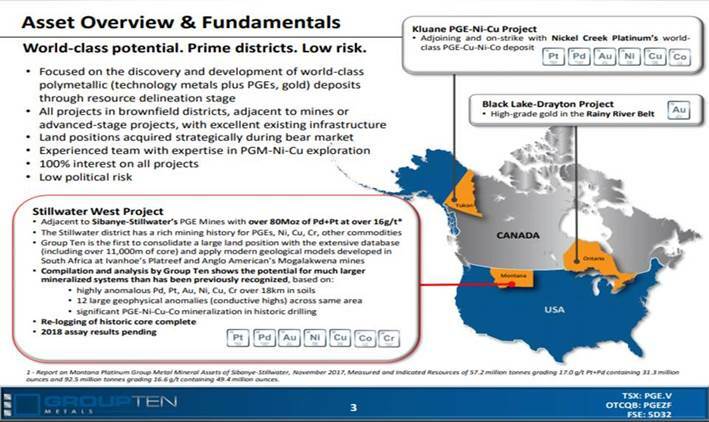 Maurice Jackson: Joining us today is Michael Rowley, the president and CEO of Group Ten Metals Inc. (PGE:TSX.V; PGEZF:OTC), which is exploring for platinum, palladium, nickel, copper and cobalt in the Stillwater district of Montana. Mr. Rowley, we have some exciting developments to discuss for current and perspective shareholders, but before we begin, for someone new to the story, who is Group Ten Metals and what is the thesis you’re attempting to prove? 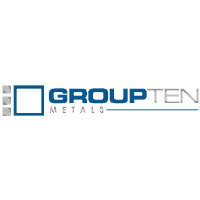 Michael Rowley: Group Ten Metals is a growth stage company, focused on PGM, platinum group metals, plus nickel, copper, also cobalt, the so-called technology battery metals. We have polymetallic deposits as these things occur together; we’re focused primarily at the Stillwater West Project in Montana. 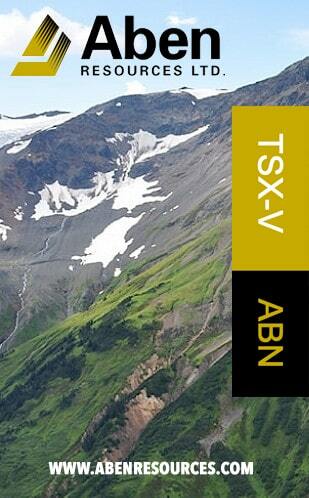 We also have assets in the Yukon and a gold project in Ontario. 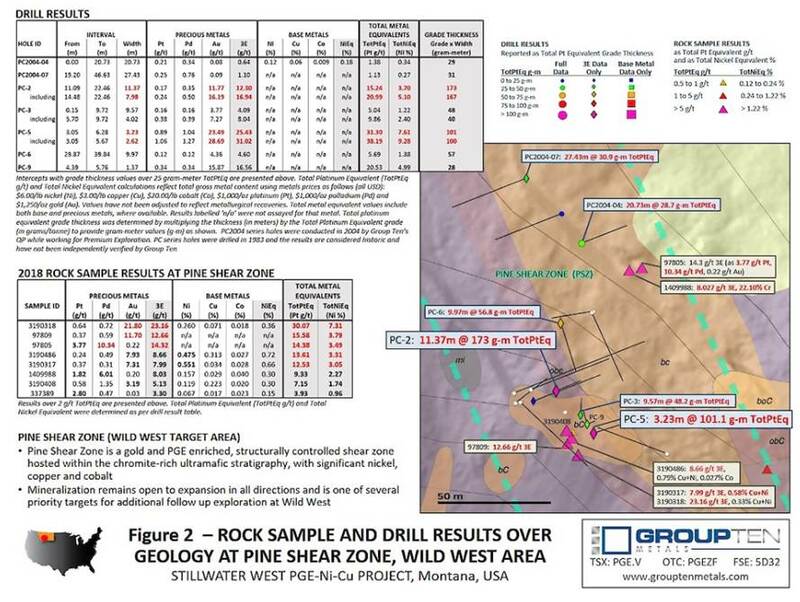 Maurice Jackson: Group Ten Metals just issued a press release announcing a new discovery hybrid zone and some targets at the Stillwater West. Multi-layered question, sir, can you update us on the Stillwater West, expand on the findings, and tell us what they mean moving forward? Michael Rowley: Stillwater West is our newest project; we made our first acquisition there in 2017. It’s a remarkable land position and database in a truly world-class district. 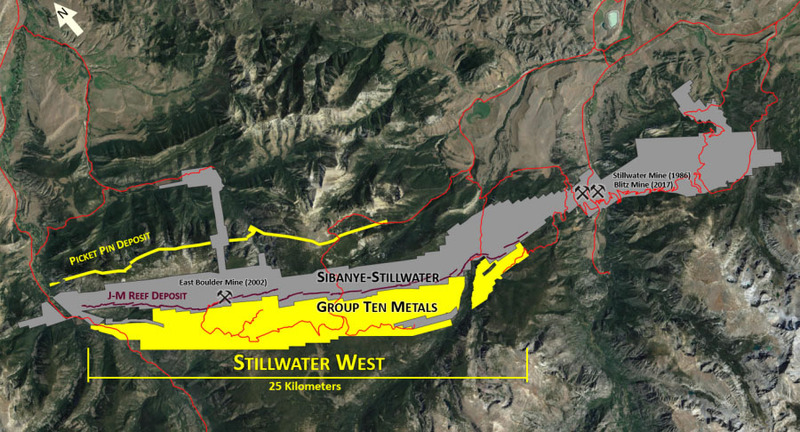 The Stillwater name, the district is synonymous with the richest palladium, platinum mines in the world, a staggering 90 million ounces in past production and current reserves producing from three mines at over half an ounce per ton, 16 grams per ton. 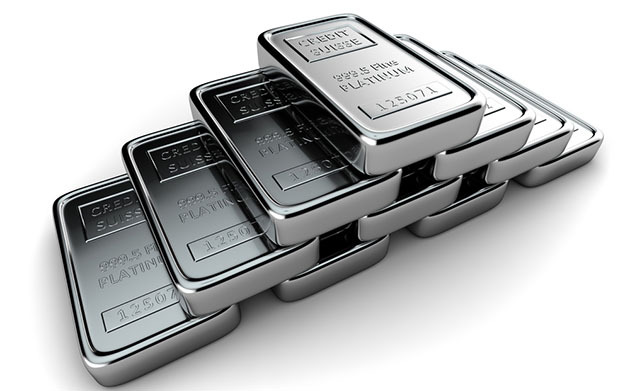 It’s platinum and palladium rich; palladium, of course, is very significant right now given that palladium is challenging gold as the most valuable precious metal. 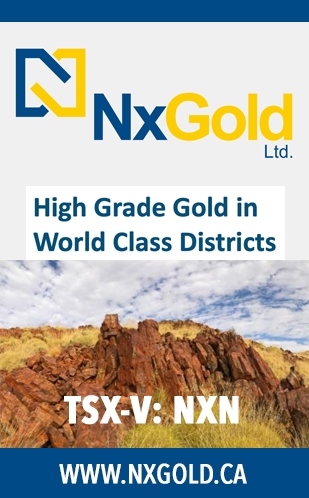 We are above and below Stillwater in this layered system and because of that we have not only the same potential for palladium and platinum, platinum group metals in general, but we also get to expand our target to these truly polymetallic things including nickel, copper, cobalt, palladium. 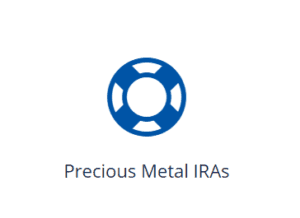 We recently added to that list, also, rhodium, and we have some significant gold. This is truly elephant country. 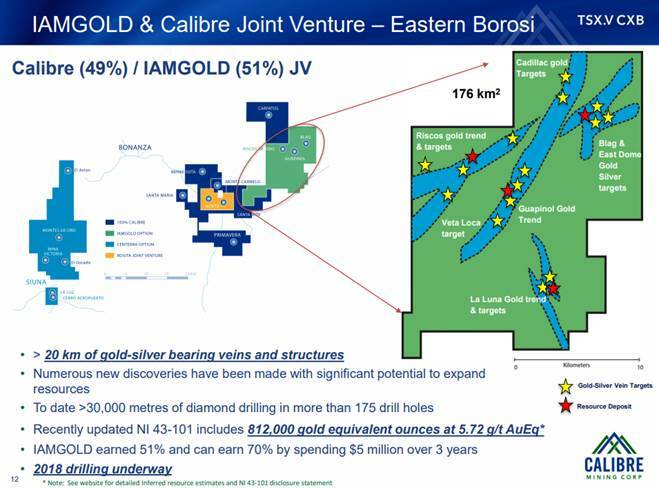 It’s the biggest PGM deposit outside of South Africa and Russia and, of course, it was bought by Sibanye our neighbor for $2.2 billion in 2017. So we’re the only other player in the district. It’s a fantastic place to be, we’re very excited. You brought up the most recent news release, December 17. The Hybrid Zone is one of our targets in the Chrome mountain area and an exciting new discovery. 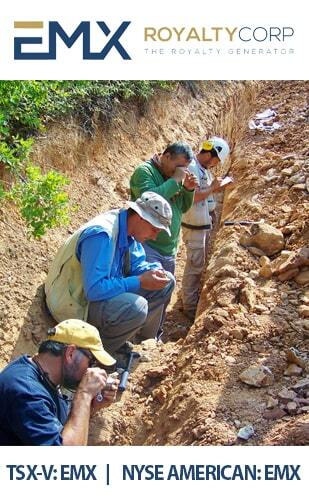 We mention up to 150 meters of mineralized intervals there in this new style of mineralization. What’s exciting is this has never been recognized in camp before and it ties into the Bushveld Complex of South Africa and, despite the known similarities between these districts, Stillwater has never been examined systematically for that potential. So in a nutshell, we are taking the lessons learned at the Mogalakwena Mine and Ivanhoe’s Platreef project and applying them to the similar geology in Montana Stillwater in a way that nobody’s done before. 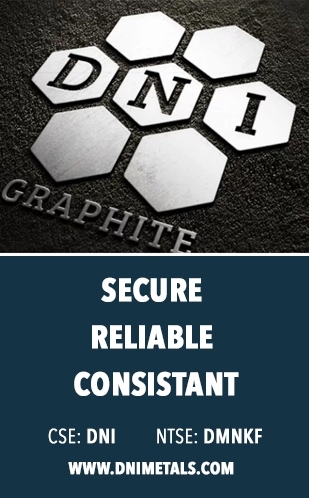 I guess final point to wrap that up is the team that we’ve attracted includes a number of renowned experts on this type of deposit, but most recently David Broughton of Ivanhoe, so we’ve actually attracted expertise and talent of a world caliber on the project. Maurice Jackson: Can you further expand on the new 14 target areas? 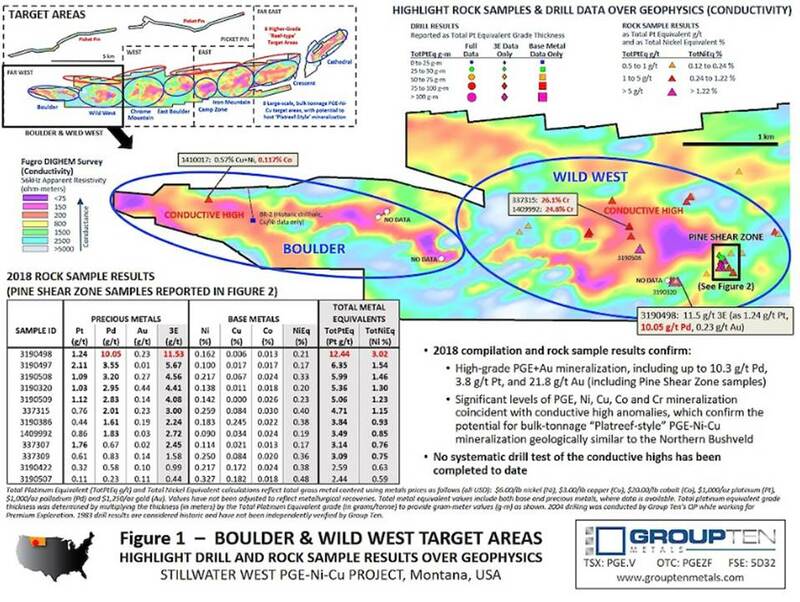 Michael Rowley: We have as a result of our efforts in 2018, being our first season on the ground, we’ve identified 14 target areas in Stillwater West, six of them fit the high-grade PGE reef type targets that the district is known for, in particular our neighbor Stillwater Sibanye Mines. 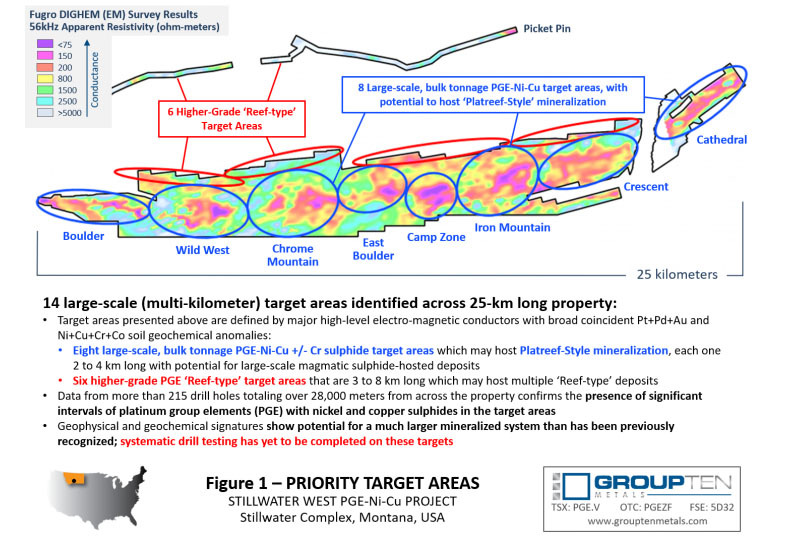 However, 8 of the 14 targets are these newer Platreef style targets where we see potential for large-scale bulk-mineable disseminated sulfide mineralization of the types seen on the Platreef District of South Africa, and that’s in the basal zones and the lower ultramafic series in Stillwater. 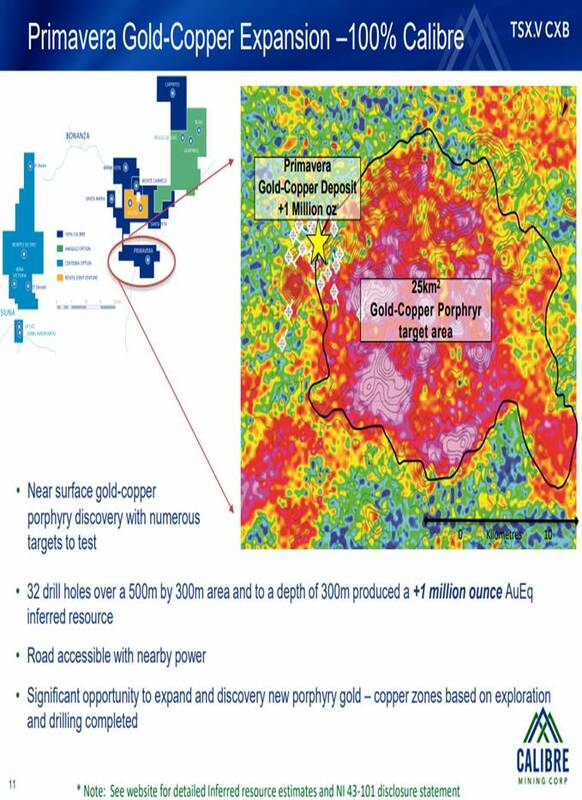 And that’s the greater potential we see there for these hundred million ounce style PGE nickel/copper deposits, also cobalt actually, at Stillwater, and news flow will be ongoing in the coming weeks and months as we reveal the results of our work in 2018, and our plans for 2019. Maurice Jackson: And what are the target commodities at the Stillwater? 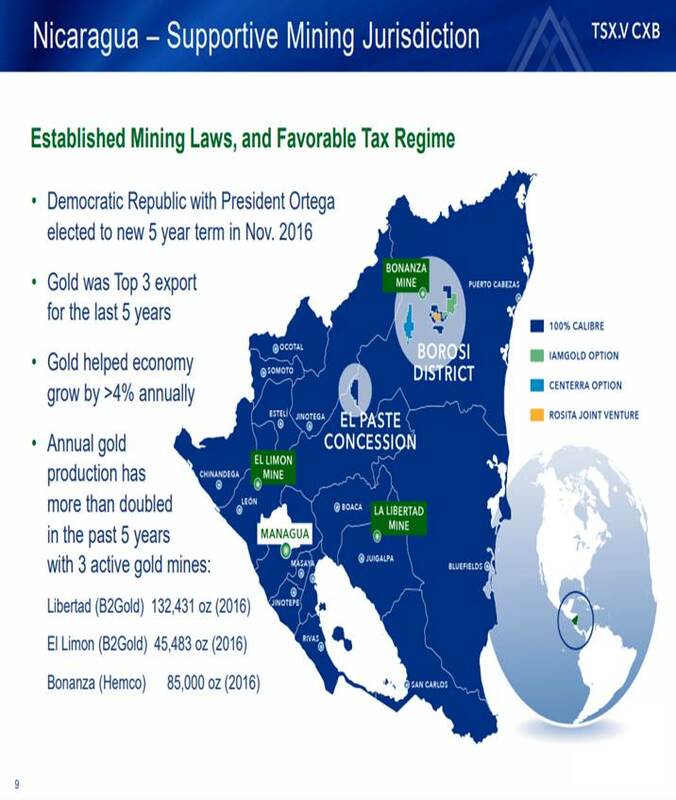 Michael Rowley: It’s a true polymetallic system; the district itself is known for having the highest-grade palladium platinum lines in the world, and that is the three operating Stillwater mines that were bought by Sibanye in 2017, in our part of the district, in the lower part you can also add to that list gold, cobalt, and chrome are significant and we are recently finding indications of potentially significant vanadium and rhodium, you can add to that list as well. 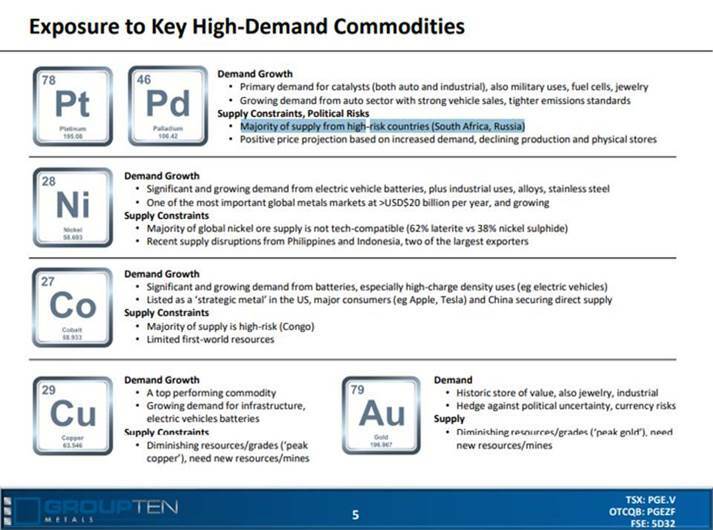 So this suite of commodities, in particular the palladium, in light of what palladium is doing in the markets these days, positions Group Ten as one of very few options in terms of PGE investment opportunity for investors, especially if one included geography in that, being that we are outside of South Africa and Russia, in North America. Maurice Jackson: Sir, what is the next unanswered question for Group Ten Metals, when should we expect results, and what determines success? 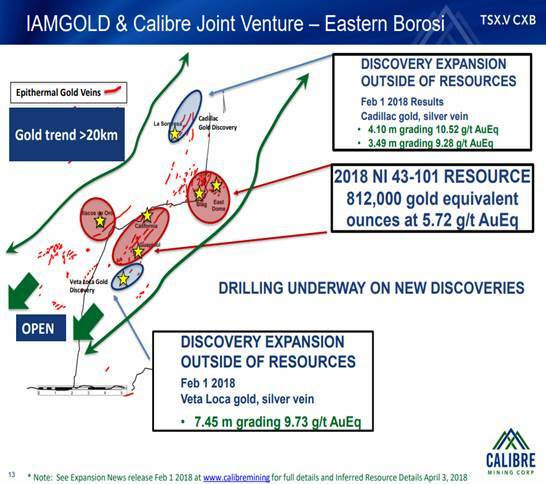 Michael Rowley: Good questions, news flow will be ongoing in the coming weeks, assays are coming in as we speak, we’re entering them into our models and planning our strategy around that, so we’re excited by what we see. I think the most exciting aspect of news is going to be the results of re-logging and modeling the more than 12,000 meters of core that we have in our possession, as we said earlier, no one has brought this land position together with the South African Platreef models, along with this physical core, so bringing these things together, and for the first time looking at this district systematically for the potential for these styles of deposits. It’s very exciting and I think the first quarter of 2019 you’ll see some very interesting news releases and materials along that line. We will be at the major trade shows, we’ll have core on display at the January shows in Vancouver, and we’ll be at the PDAC in Toronto in March as well, and we look forward to seeing anybody and everybody there. Maurice Jackson: Sir, we’ve covered the good, what keeps you up at tight that we don’t know about? Michael Rowley: Well, frankly, our share price isn’t where I’d like it to be and I don’t think it reflects the potential of the company, that is of course seasonal and the juniors (miners) do generally get hit harder this time of year, however, gold has held up very nicely, and other commodities are following it, and the majors have moved up nicely. So I think we can expect a good rebound in 2019 from the mining sector, and from the juniors, and then, of course, there was also our own work, especially Stillwater I think will get some nice life, in addition to the rising tide, that floats all boats. Michael Rowley: Well, it’s not that you forgot to ask, but let’s revisit and touch on something we’ve talked about before, the fact that 75% of the world’s PGM metals come out of South Africa—this has been written up very well recently by the CMP group out of New York—a lot of those mines are facing closures, they’ve been underfunded for years, and this is expected to drive the platinum price substantially into the year 2020. Palladium, of course, is already up and platinum is expected to follow. It’s worth noting, perhaps, that those are reef mines, they’re deep, they’re hot, they’re expensive, they’re dangerous, the mines of a Platreef, north of the Bushveld, are our current model with Stillwater, and those are highly economic and they keep producing, and that’s what we expect to bring to Stillwater for everyone’s benefit. Maurice Jackson: Mr. Rowley for someone listening that wants to get more information on Group Ten Metals, what is the website address? Michael Rowley: Website is grouptenmetals.com. 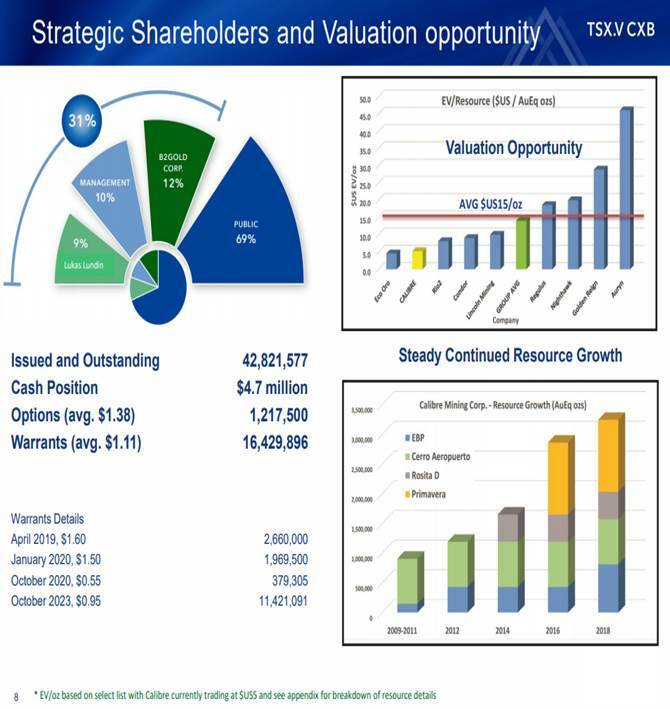 Maurice Jackson: And as a reminder, Group Ten Metals trades on the TXS.V:PGE, and on the OTCQB:PGEZF; for direct inquiries please contact Chris Ackerman at 604-357-4790 extension 1, or email info@grouptenmetals.com, as reminder Group Ten Metals is a sponsor of Proven and Probable, and we are proud shareholders for the virtues conveyed into today’s interview. Last but not least, please visit our website www.provenandprobable.com where we interview the most respected names in the natural resource space. You may reach us at contact@provenandprobable.com. 1) Maurice Jackson: I, or members of my immediate household or family, own shares of the following companies mentioned in this article: Group Ten Metals. I personally am, or members of my immediate household or family are, paid by the following companies mentioned in this article: None. 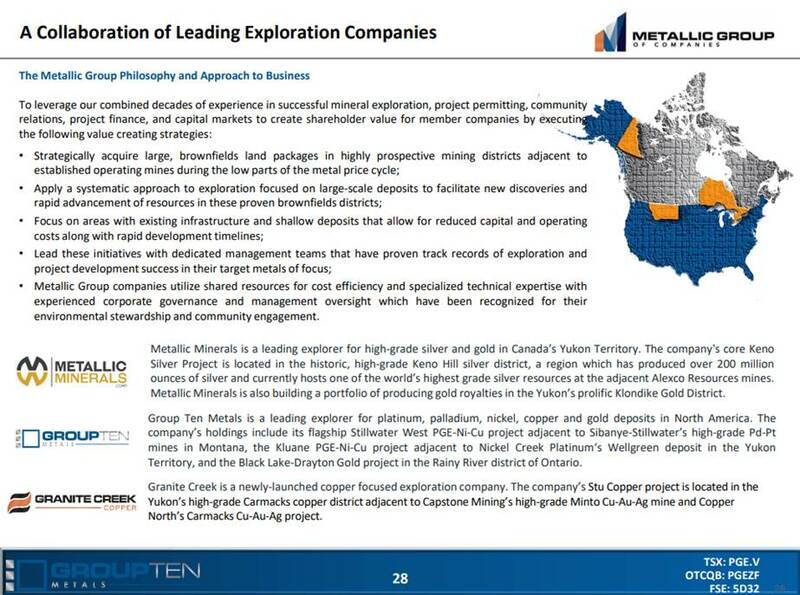 My company has a financial relationship with the following companies mentioned in this article: Group Ten Metals is a sponsor of Proven and Probable. Proven and Probable disclosures are listed below. 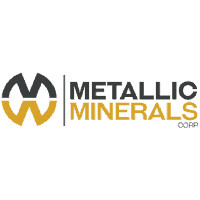 This entry was posted in Base Metals, Exclusive Interviews, Junior Mining, Precious Metals on December 28, 2018 by admin. Dear Subscribers, on behalf of Stock Pulse we are happy to share the following interview. Please click here to visit our friends at Stock Pulse. 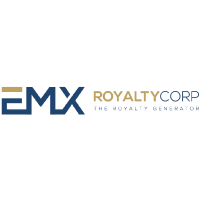 This entry was posted in Base Metals, Exclusive Interviews, Precious Metals, Project Generators on December 27, 2018 by admin.